In 2009, the Massachusetts Department of Revenue, Division of Child Support Enforcement (DOR) applied for and received a Section 1115 demonstration and evaluation grant from the Federal Office of Child Support Enforcement (OCSE). The application was submitted in response to an OCSE initiative aimed at improving the ability of state child support enforcement programs to proactively address the effect of the economic downturn on non‐custodial parents who have lost their jobs and/or experienced a reduction in pay. The purpose of the Massachusetts grant was to explore possible ways of streamlining its modification process. The resulting “Developing and Testing a Streamlined Modification Process for Newly Unemployed Obligors” (90FD0157) (the Project) had the goal of developing and testing a streamlined modification process in the Bristol Division of the Massachusetts Probate and Family Court (the Court or Probate and Family Court), with possible expansion to all divisions of the Court. Under the Project, the DOR and the Court convened a task force to explore and formulate innovative ways to expedite the modification process in Massachusetts and to issue recommendations. 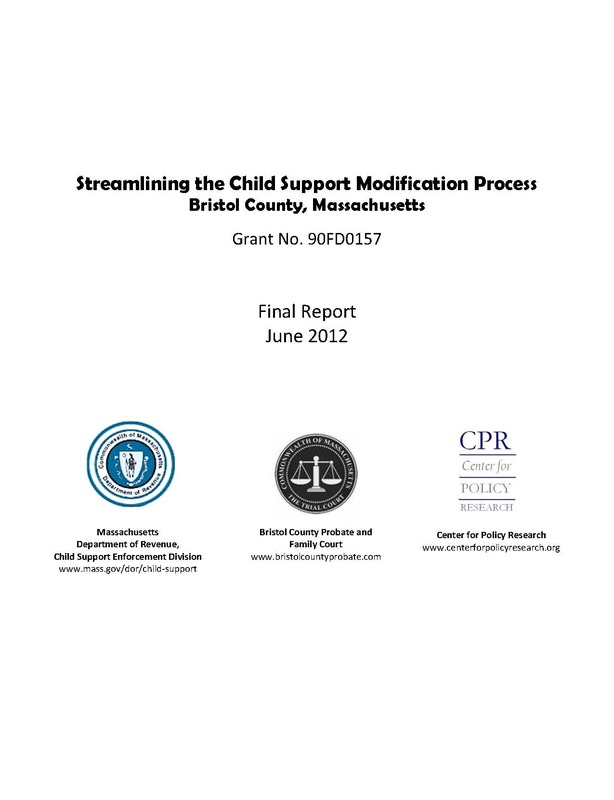 With the approval of the Chief Justice for Administration and Management of the Massachusetts Trial Court and the Chief Justice of the Probate and Family Court, some of the recommendations were subsequently tested in the Bristol Division with individuals seeking child support modifications. This report describes the streamlined modification procedures adopted for implementation in the Bristol Division, the method used to assess the effectiveness of the new procedures, and the results of an analysis of pre‐pilot and pilot modification practices and outcomes. The report begins with background information on the rationale for the project, the Massachusetts modification process, and the experiences of other states with streamlining modification processes.